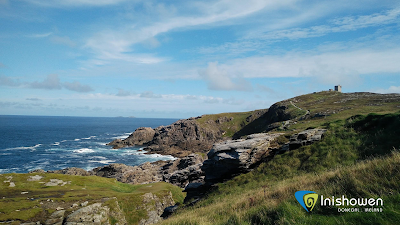 Malin Head is Ireland's most Northerly Point situated a short drive from Malin Town pictured above. On route to Malin Town, you will pass over an historic ten-arched bridge which leads to this bright and charming village. 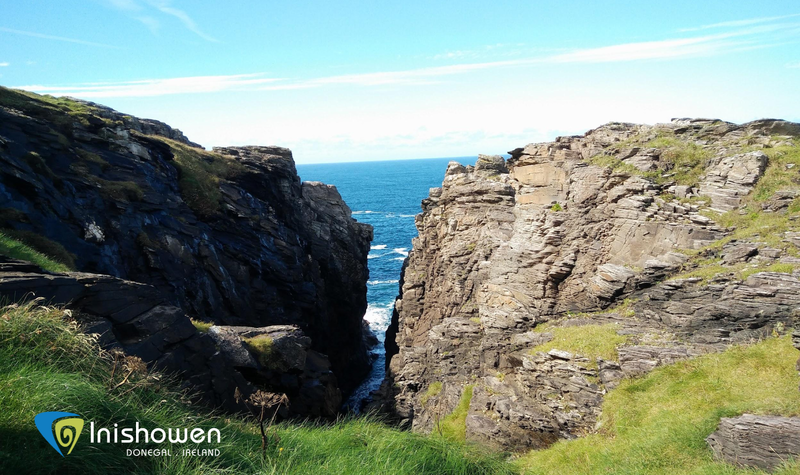 The word Malin itself originates from the Irish word Malainn meaning Braeface or Hillbrow, which hints at the type of geography you will encounter at this stunning location. 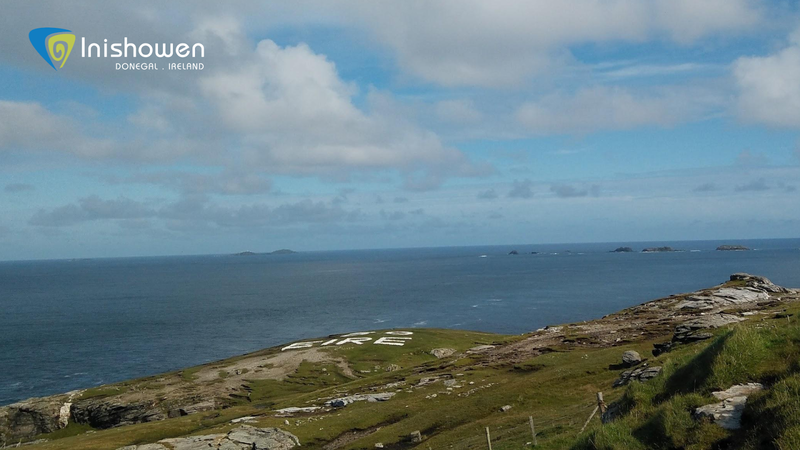 On approach to Malin Head you will be greeted by an impressive Tower built in 1805 to act as a Signal Tower for the British Admiralty during the Napoleonic Wars. 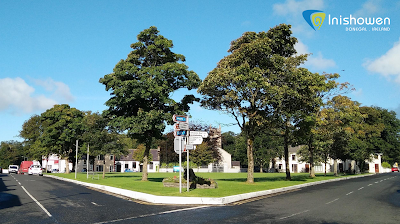 Today it is recognized as signature point along the popular Wild Atlantic Way Route. In front of the Tower you will notice a large Eire symbol, pictured above, that is marked out by white stones on the landscape. 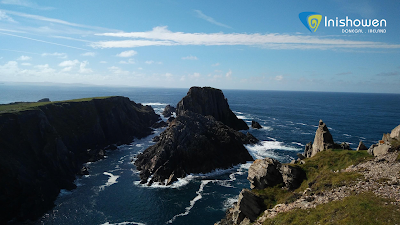 Eire was used during the Second World War to inform fighter pilots on approach to Malin Head that they were in Ireland, a country of neutrality. Located at Malin Head is a trail, viewed above, that will take you along a scenic path packed with wonderful views across the Atlantic and Inishowen Landscape. The route itself is graded as a moderate walk spanning a distance between 570-655m. A purpose built path with signage, will lead you along the picturesque headland. From Malin Head you can view neighboring sites in County Donegal such as Fanad Head Lighthouse. This impressive Lighthouse marks the entrance to Lough Swilly that separates the Fanad Peninsula from the Inishowen Peninsula. On a clear day, the headlands of Horn Head and Dundaff Head, in the wider Co Donegal area can also be seen. Making your way along the walk some of the sites you can see, weather permitting, include the beautiful Tory Island and to the North East the captivating Inishtrahull Island that you can see above. On a clear day it is possible to see the hills of Western Scotland and the Island of Islay. 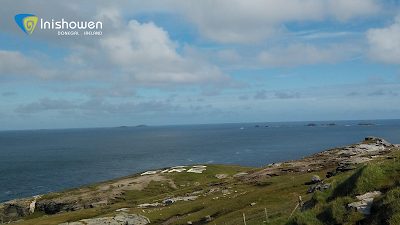 The rock at Malin Head is composed primarily of igneous and metamorphic rock that formed over 400 million years ago. During your walk you will notice a number of these striking rock formations, which includes Hells Hole, a deep chasm in the rugged cliff face with a subterranean cave, pictured above. At Hells Hole and throughout the trail you can see and hear the power of the sea as it crashes against the rugged rocks and coastline. The captivating nature of the cliff walk and its surrounding scenery is a perfect location to capture the imagination of visitor and local alike. 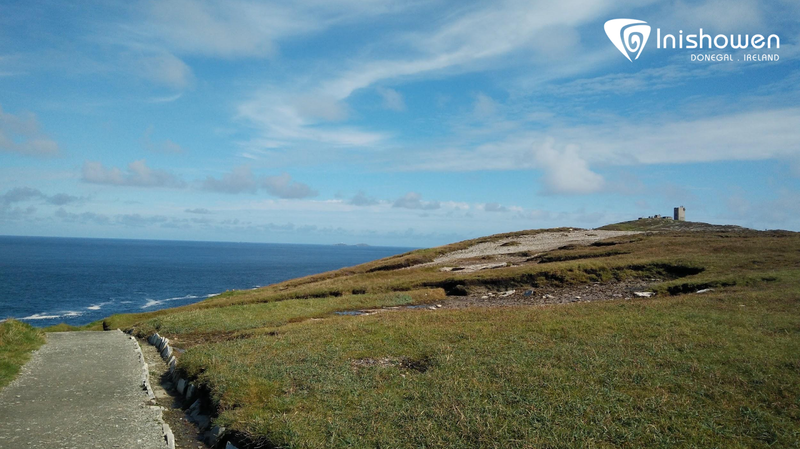 From your visit to Malin Head you can understand why a section of the headland that lies beyond the trail was chosen to shoot a number of scenes of the eagerly anticipated Star Wars Episode VIII due to air on December 15th 2017. Stay tuned for another installment of our walking guide series that provides information on scenic walks around Inishowen.